“History has no conscience. If you’re still alive, that’s just because its foot hasn’t stepped on you yet.” ~ Naseer Hassan, writer and radio host at Radio Free Iraq It may be too soon to tell the consequences of that fateful spring day when American forces invaded Iraq 11 years ago, but all signs point to a rather bleak picture: one that was poignantly painted last week by Roy Scranton, a former U.S soldier in the 1st Armored Division. His article in Rolling Stone Magazine reveals not only the inner struggles many veterans currently face when coming to terms with their time in the troubled Gulf state, but also those of a superpower still readjusting its identity after calls of short-sighted imperialism. Now a PhD candidate in English at Princeton University, and a New School for Social Research and New School for Public Engagement alumnus (MA in Liberal Studies ’10 and BA ’08, respectively), Scranton had spent 2003 surveying the streets and neighborhoods of Baghdad through the view from his “ballistic windows” of a Humvee. Ten years later, he returned to those same streets, removed from the military vehicle, only to find that his “mantra of comforting phrases that numbed doubts [of the 2003 invasion] and fuzzed out [his] connection to the big picture” were no longer adequate. 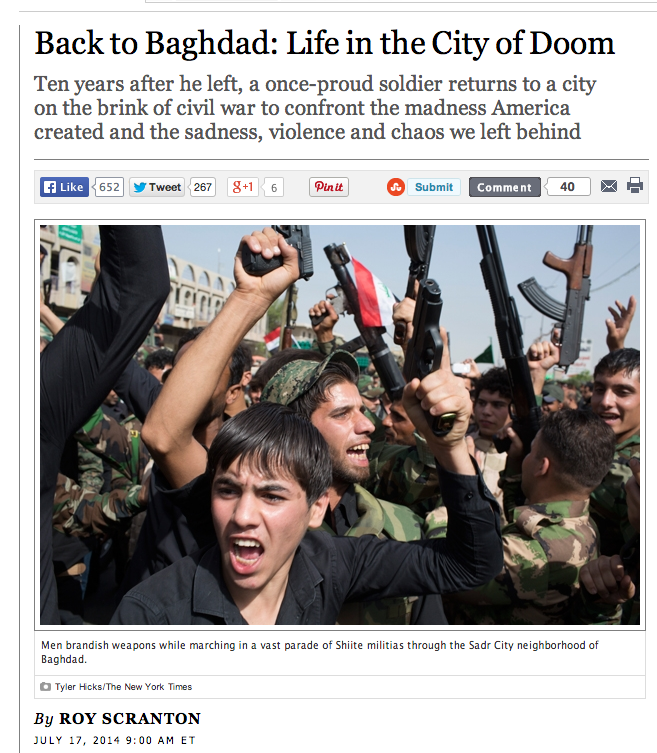 Read more from Back to Baghdad: Life in the City of Doom. For more work from Roy Scranton, visit his website at www.royscranton.com/.